Cooperative diversity is a promising technique to increase link reliability and coverage, however, its performance is affected by interference created by concurrently transmitting nodes over the same time-frequency resources. More specifically, interference is spatially correlated across cooperating nodes and this type of correlation may expunge the diversity gains known for the interference-free case. This chapter analyzes this effect using tools from stochastic geometry. First, the diversity order bottleneck for a simple three-node relaying system using selection decode-and-forward is identified and specific conditions under which the diversity order corresponding to the interference-free case can be recovered are found. Second, the concept of cooperative interference cancellation is proposed, which exploits the fact that interference is correlated across cooperative nodes. Possible deployment scenarios, the importance of the correlation of the interference signal, as well as remaining technical challenges are discussed. Finally, a first simulation-based analysis demonstrates that cooperative interference cancellation can increase throughput by around 25 % in a typical 4G network. This work was supported by the German Research Foundation (DFG) under Grants JO258/21-1 and JO258/21-2. 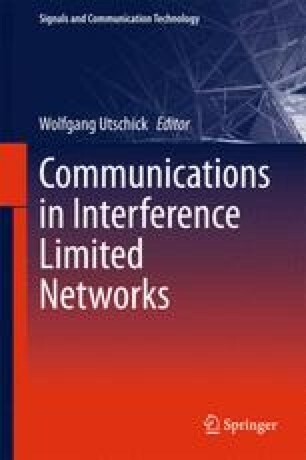 The authors would like to thank their colleagues from KT Duisburg-Essen, namely Andrey Skrebtsov, Guido Bruck, and Peter Jung, for the cooperation within the projects StoCCNets and CREDIT.